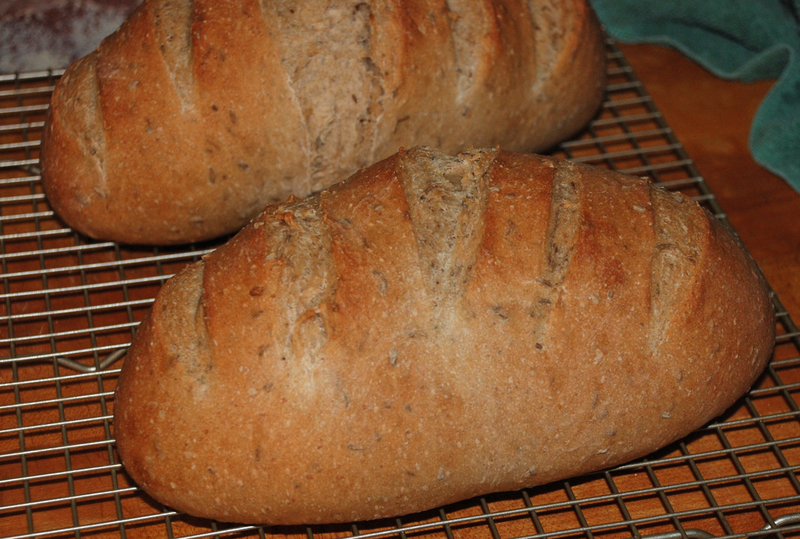 This recipe comes courtesy of David Snyder who posted his adaptation on The Fresh Loaf here. I have posted about other rye breads I have tried making previously and I have to say all of them including this one have come out pretty good. The big difference in this recipe is that all of the rye flour is added into the rye sour and the dough is fairly high hydration compared to the other ones I have made. I ran out of First Clear Flour so I had to substitute 217 grams using KAF High Fiber Flour instead. I think the bread would have turned out better if I had used 100% First Clear to be honest. I also added some dried Toasted Onions which I reconstituted in the water used for the final dough which gave the rye a nice onion flavor which I love. One other point is that I followed Davids instructions for making a 100% Rye starter using Pumpernickel flour and I only ended up with 708 grams instead of 750 grams called in the recipe. I am not sure if this had that much of an effect on the final bake, but next time I will make a larger batch of starter since I would have liked to keep some for my next bake so now I have to start all over again :(. I do have to say I have made Rye starters in the past and I really like the way this one came out. You can follow Dave’s excellent instructions here if you are interested in converting your starter to a Rye sour starter. Also, I did not have any leftover rye bread so I didn’t add the Altus to this bake, but next time I will add it to see the difference. I have made rye breads with and without the Altus and have not made up my mind if it is necessary or not. The end result of my bake was not as open of a crumb as David achieved, but throw some pastrami and Thousand Island Dressing or mustard for you traditionalists out there and deli nirvana is at your fingertips! Also note that most Jewish Rye recipes call for the use of First Clear Flour which is taken from what remains after the millers sift the patent flour out of the straight flour. Patent flour is the purest and highest quality flour available. First clear flours come from hard wheat and has a protein content of 15.0 – 18.0% which is ideal to strengthen the lower protein content of rye flours which are normally around 6.5%. High-gluten flour can be substituted for First Clear and has a protein content of 13.5- 14.5%. 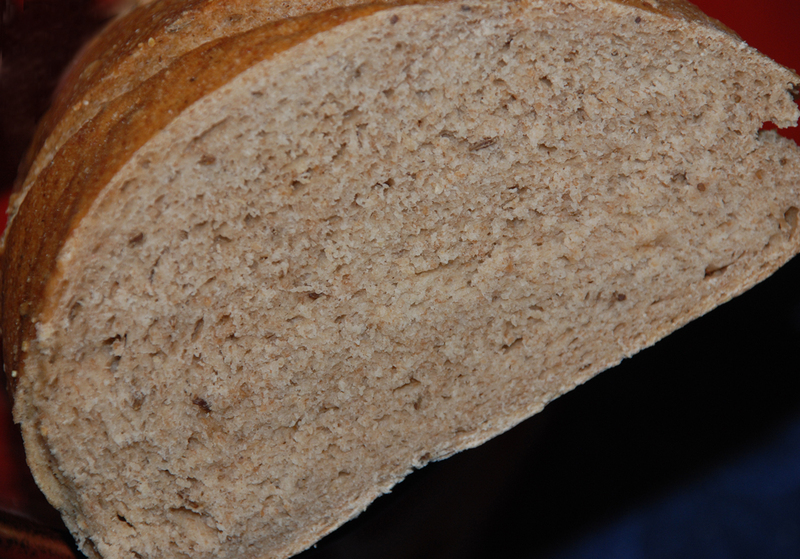 Medium rye flour is milled from the whole grain after the bran has been stripped away and is used for high-percentage rye recipes (heavier breads for sure). Dark rye flour, is what remains of the rye kernel after the white rye flour has been sifted out. As you can imagine it is very dark and strong flavored flour. One of my favorite things to eat is a hot Pastrami on Rye with Thousand Island dressing. We happen to have a little gem of a pub in town called Reese’s which is one of the oldest on Long Island, New York where I live and it serves one of the best pastrami sandwiches I’ve ever had. Anyway, if you want to make your own pastrami sandwich you have to start with a great Jewish Rye bread which is easier said than done. I’ve tried many recipes over the years and few have lived up to my high expectations. I recently purchased a new book to add to my extensive cookbook library called Inside the Jewish Bakery by Stanley Ginsburg and Norman Berg. I’ve only read about 25% of the book so far, but I really have enjoyed the history lesson regarding the origins of Jewish bakeries in America. I do have to say, after reading a brief description of the daily life of a Jewish Baker I don’t think I’m ready to open my own bakery just yet if ever! I have tried several of the recipes so far in this excellent book with some mixed results but I was very happy with how my attempt at the Old-School Jewish Deli Rye came out. 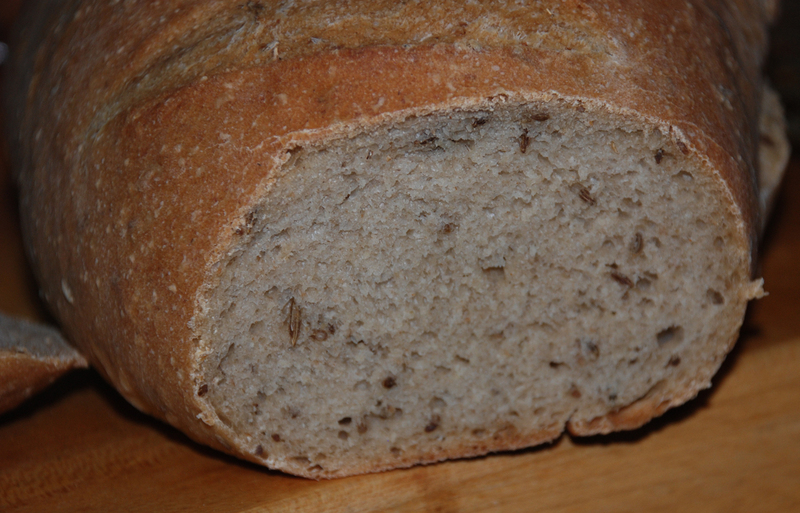 This loaf is a 40% rye that has a nice tangy flavor as a result from a three-stage build for the sour. One thing that I found interesting in this book is the brief description debunking the need to add “altus” or left-over bread to make an authentic Jewish Rye bread. It is a fact that many old-school Jewish bakers did add the altus to their loaves, according to the authors it has a marginal effect on the final outcome of the bread. In other words, unless you have left over bread you want to get rid of it is not necessary to create an authentic Jewish rye bread. I have tried this method in the past in other recipes and have not found it to make that much of a difference in the final outcome of the bread. To make the recipe below I converted my 68% hydration white flour starter to a 80% rye flour starter. 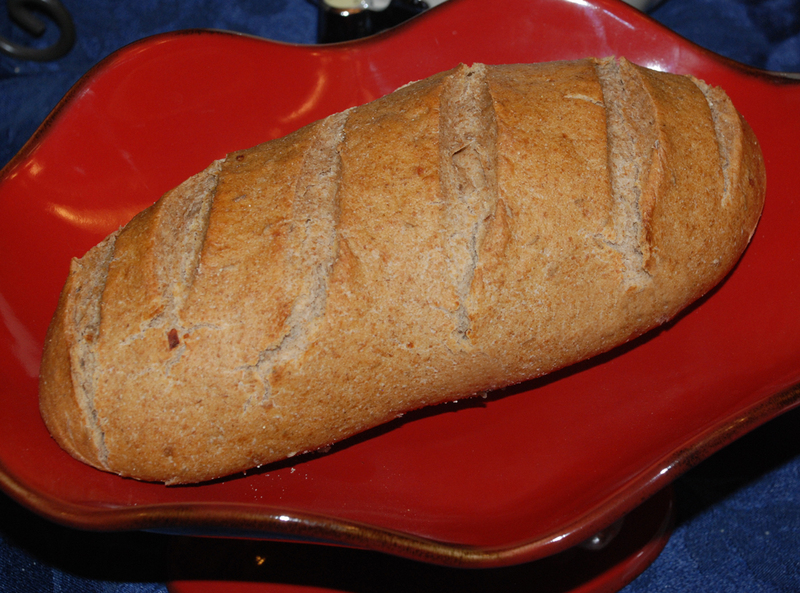 If you already have a whole wheat starter you can use that instead to create the rye starter below. Also note that most Jewish Rye recipes call for the use of First Clear Flour which is taken from what remains after the millers sift the patent flour out of the straight flour. Patent flour is the purest and highest quality flour available. First clear flours come from hard wheat and has a protein content of 15.0 – 18.0% which is ideal to strengthen the lower protein content of rye flours which are normally around 6.5%. White rye flour is very important in authentic Jewish style rye breads and comes from the heart of the endosperm. It contains only 6.5% protein. 2.5 oz. (70 grams) White Rye Flour (you can get this at King Arthur Flour or other online sources) You can also use medium Rye Flour for a stronger Rye Flavor in your bread. Combine all the ingredients in a bowl until thoroughly mixed and cover with a saucer, plastic wrap or dish towel in a warm place for 5-6 hours. The starter should increase in bulk and have a fresh, sour smell. 5.0 oz. (140 grams) Sour from above. Add all ingredients together and cover and let ferment for 4-5 hours until bubbly and then place in refrigerator overnight. Add the hot water to the sour, and blend together. In a separate mixing bowl combine the flour, yeast, salt, ground caraway and 2 Tbs. of the seeds (if using) and blend together by mixer or hand with a whisk or wooden spoon. Now add the sour mixture and continue mixing until the dough is smooth and firm. If using a mixer, switch to your dough hook (I have a Bosch which only does not use a dough hook) for 6 to 8 minutes or knead by hand until the dough is smooth and firm. Place in a glass or plastic bowl covered to rise until doubled in bulk. Depending on how hot it is in your kitchen this could take anywhere from 60 minutes to 2 hours. Around 20 minutes before baking, pre-heat your oven to 375 degrees F./190 degrees C. and put a pan to hold water on the bottom rack of your oven along with a baking stone. Put the risen dough on your work surface and degas it completely. If you are afraid of the dough sticking to your work surface, you can use some bakers spray or oil spray. Divide the dough into 2 pieces and press the dough into a flat oval and roll it towards you and form a football shape with rounded edges. Set the loaves on a peel or parchment paper that has been dusted with cornmeal with the seams facing down. 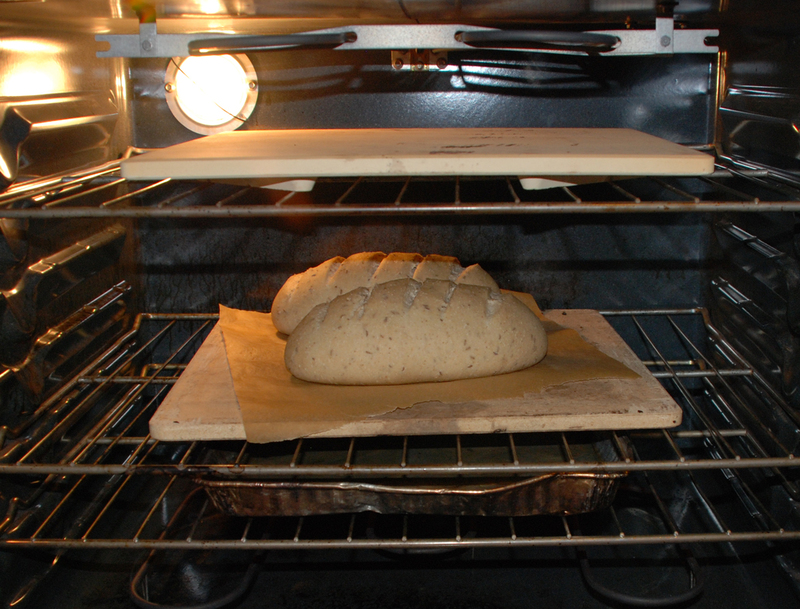 Cover loaves with a damp towel and allow them to rise until they are about 1 1 /2 times the original size. This should take around 60 minutes or less and if you poke your finger gently into the dough it should leave a slight dent. 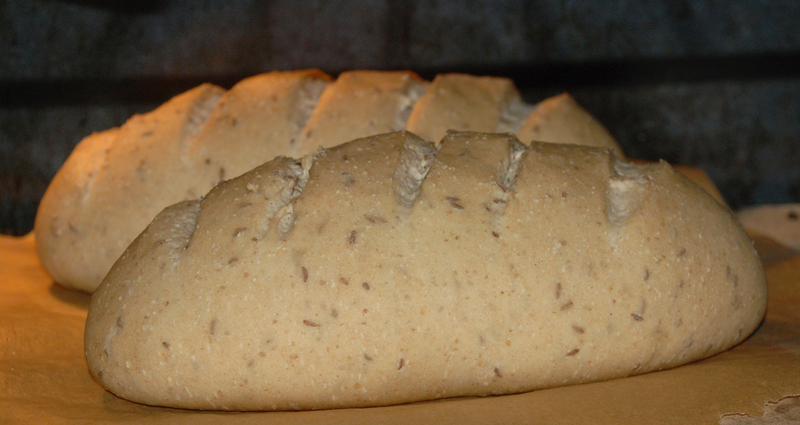 You can now brush or spray the loaves with water and apply the seeds if desired. Pour cup of boiling water ( I usually use the hottest water I can get from my tap which works fine) into the pan on the bottom shelf of your oven, slash the loaves 2 to 3 times crosswise and slide them onto the stone in your oven. I usually also spray the inside of my oven 2-3 times for good measure. After 3 minutes pour 1 more cup of boiling water into the pan on the bottom. Bake the loaves for another 15 minutes and turn them to make sure they are cooking evenly. After an additional 20-30 minutes the crust should be a deep golden brown and the loaves should sound hollow when tapped on the bottom. I usually check with an instant read thermometer and make sure they are 190 degrees F. or 200 degrees F.
This post has been submitted to the Yeast Spotting Site here: http://www.wildyeastblog.com/category/yeastspotting/. This post has also been submitted to http://www.girlichef.com/p/byob-bake-your-own-bread.html, so please visit them for even more baking recipes.